오는 3월26일부터 27일까지 2일간에 걸쳐 영국 런던 Heathrow 미들섹스(Middlesex, UB7 0DU)에 위치해 있는 Park Inn 호텔에서 하이파이 오디오 전시회가 열린다. 이번 전시회에서는 첨단 오디오시스템을 비롯해 각종 독특한 이벤트가 준비되어 있어 오디오 파일들의 관심을 모으고 있다. 특히 오디오 파일들의 특수한 제품에 대한 설명회와 더불어 각종 푸짐한 행사가 준비 되어 있다고 한다. 소규모 이지만 약 31개의 전시관이 마련되어 있다. 특히 아날로그 제품에 대한 코너들이 관심을 끌고 있다고 한다. 다음은 주체측이 이 번전시회를 위해 홍보하고 있는 원문을 참고하시기 바랍니다. Welcome to the new face of our Spring Show! There is a saying that if something isn't broken why try to fix it, but in the case of our Spring Show is wasn't broken but it really needed to support our National Audio Show, not only in a more corporate identity but also in the way it provided small to medium sized businesses as a stepping stone to this International event. AUDIO WORLD is a unique event, very eclectic and often with emerging products or the very hard to find. It is without doubt the enthusiasts show. Here's what we are planning for 2011. The change of name, but the same weekend and location. Guest Speakers and clinics. Top names, easy entrance. Improved parking facilities: guaranteed you'll be able to park for just £1 per hour. More budget priced Food and Beverage. Free Magazines - and no increase in admission Further improved ticket downloading, for both Visitors, Trade and Press. 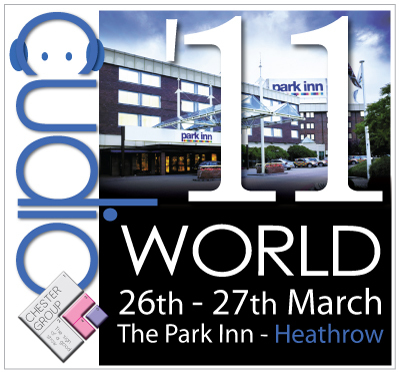 Tickets for Audio World '11 are now available for download. You can either use the DOWNLOAD TICKETS link or click the image to the left to register for your ticket. After downloading your ticket just simply turn up and pay on the day using your printed ticket to benefit from the discounted entrance price of just £10.00. For those of you who go to the trouble of downloading your tickets you will receive a free AMR Gold Fuse worth £12.00. See below for further details.